A lovely collection of Lowland malt whiskies from Auchentoshan. This gift set comes with three sample bottles of 50ml each. The whiskies on offer demonstrate the variety of this fantastic distillery, with samples of the American Oak, 12 Year Old and Three Wood all included. 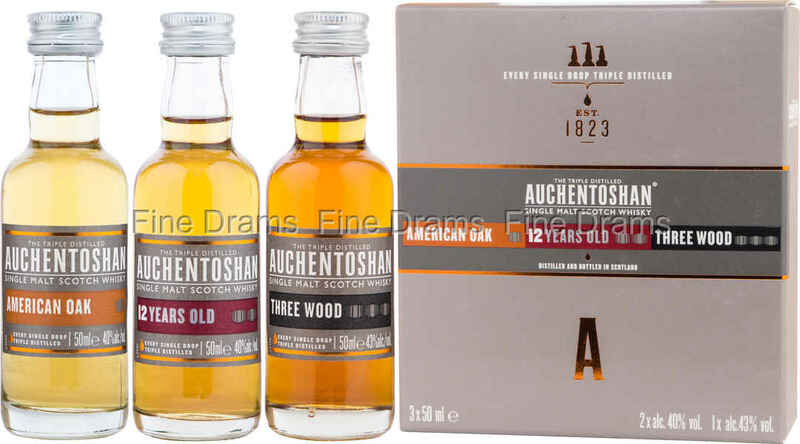 The American oak is Auchentoshan in pure Lowland malt mode, with delightful floral flavours and plenty of vanilla and toffee flavour from the cask. The 12 Year Old adds a little sherried complexity, being drawn from both Oloroso and Bourbon casks. The Three Wood kicks up the complexity further still, using sweet Pedro Ximénez, Oloroso and Bourbon casks, to provide a deep sherried dried fruit flavour. This gift set is an excellent means of getting to know the range of this distillery, and the effects that various cask maturations can have on a whisky. Perfect as a Christmas or birthday present for the whisky lover in your life!